Lunar researchers want to take advantage of Trump administration’s political interest. When Apollo astronaut Eugene Cernan stepped off the Moon in December 1972, it marked the end of US researchers’ access to the lunar surface. Since then, no US mission has touched down there to collect scientific data. That could soon change. In December, President Donald Trump ordered NASA to send astronauts back to the Moon. On 12 February, he proposed a 2019 budget that would allow the agency to begin planning a US$200-million lunar exploration programme. In the weeks since, NASA officials have started sketching out how that effort might unfold — from a series of small commercial landers, to larger NASA landers, to a multinational space station near the Moon that could serve as a base for robots and astronauts travelling to the lunar surface. For US Moon researchers, Trump’s plan is the first chance for an extended research programme since President Barack Obama cancelled lunar exploration plans in 2010. “It’s an exciting time to be a lunar scientist,” says Ryan Watkins, a Moon expert at the Planetary Science Institute who works in St Louis, Missouri. Congress has yet to approve either the president’s budget request or his nominee to lead NASA, Representative James Bridenstine (Republican, Oklahoma). But for now, the agency’s acting administrator is moving ahead with the lunar push (see ‘Back to the Moon’). Over the past decade, NASA has sent the Lunar Reconnaissance Orbiter to map the Moon; the Lunar Crater Observation and Sensing Satellite to crash land near the south pole in search of water; the Gravity Recovery and Interior Laboratory to plumb the Moon’s gravity field; and the Lunar Atmosphere and Dust Environment Explorer (LADEE) to study its tenuous outer atmosphere. These and other missions have opened new areas of research, says Dana Hurley, a planetary scientist at the Johns Hopkins University Applied Physics Laboratory in Laurel, Maryland. “Our understanding has evolved so much in the last decade,” she says. Take LADEE, which detected traces of water in the lunar atmosphere that were probably carried there by meteorites. Researchers need more detailed observations to better understand how water moves around on the lunar surface and into the atmosphere. “We didn’t even know to ask those questions before,” Hurley says. She and other US scientists, in a collaboration known as the Lunar Exploration Analysis Group, have been churning out studies on how future missions might answer key science questions. Getting better dates for impact craters on the Moon, for instance, can help establish whether the Solar System experienced a cataclysmic meteorite bombardment 4 billion years ago. For the first time, NASA may use commercial landers to reach the lunar surface. Companies such as Moon Express of Cape Canaveral, Florida, and Astrobotic of Pittsburgh, Pennsylvania, have been developing small landers hoping to get NASA’s business. 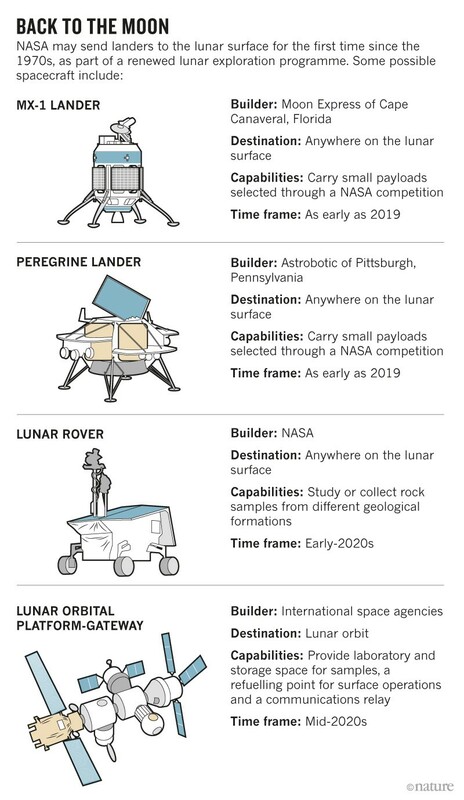 Neither they nor any of their competitors were able to claim the $30-million Google Lunar XPRIZE, a privately funded effort to put landers and rovers on the Moon by the end of this month. Still, many expect NASA to call in the coming months for proposals that rely on small commercial landers. The first lander missions would probably be short-lived trips to sites on the Moon’s near side. 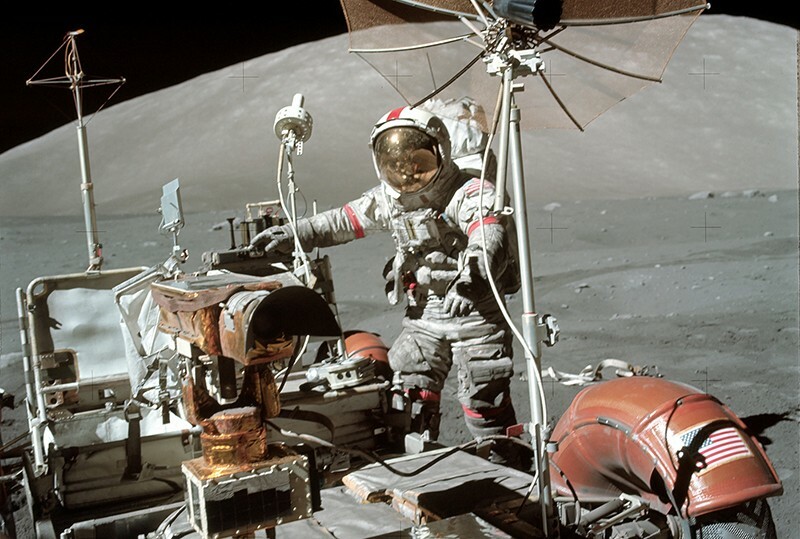 But scientists could piggyback on those journeys to study topics such as the plasma environment around the lunar poles, or to begin establishing a network of geophysical landers that would listen for moonquakes. Later missions might involve a rover travelling through several permanently shadowed regions, where astronauts might one day mine ice. By the mid- to late 2020s, NASA might be able to bring samples back to Earth via the space station orbiting the Moon. Other nations will grab the lunar limelight much sooner. India is slated to launch its Chandrayaan-2 rover later this year to explore near the Moon’s south pole. And China is planning to send its Chang’e-4 rover to the lunar far side — a first for any space agency — by the end of the year. NASA’s challenge will be to keep its latest initiative from falling by the wayside, as did its last big lunar programme — which ran from 2004 to 2010. “I’m excited about the lunar exploration campaign, but concerned we’re not making enough investments to get to the surface,” says David Kring, a planetary scientist at the Lunar and Planetary Institute in Houston, Texas. He notes that Trump directed astronauts to the Moon — and robotic landers do not meet that goal, no matter how much data they collect. Cohen, B. A., Miller, J. S., Li, Z.-H., Swindle, T. D. & French, R. A. Geostand. Geoanal. Res. 38, 421–439 (2014).